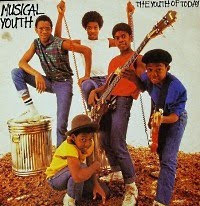 Musical Youth, "Pass The Dutchie"
Give your band a name you can grow into, not out of. Don't have the following words in your name: boy, youth, new, or Menudo (which I think is Spanish for hairless male). You'll eventually outgrow your name and be forced to change it, break up, or go by your band's initials (holla, NKOTB!). Just ask today's band. From 1982, here's "Pass The Dutchie" by Musical Youth.